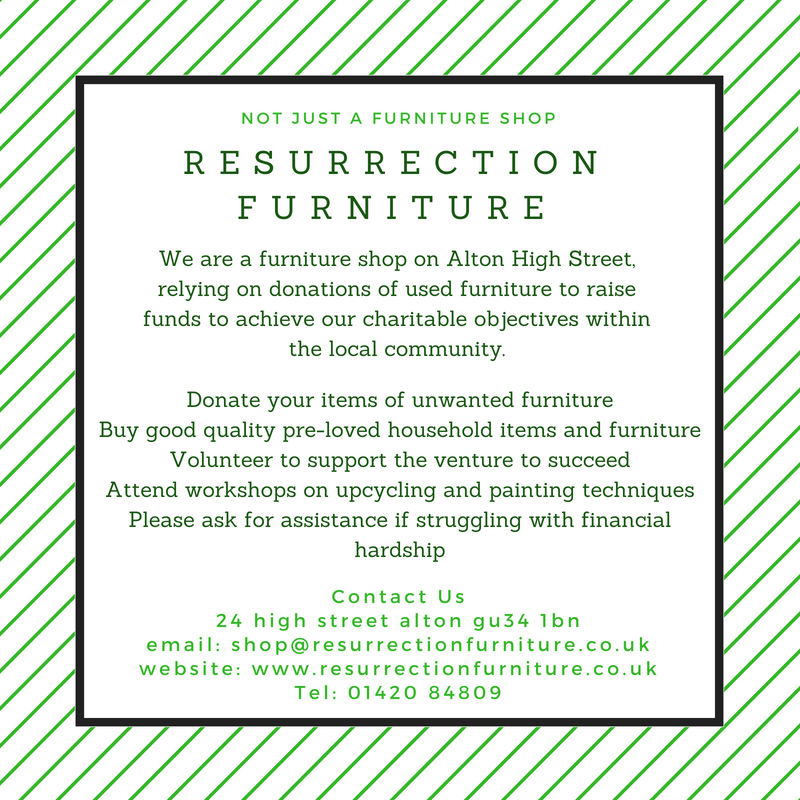 Resurrection Trading is the charity set up by a group of trustees to operate Resurrection Furniture on Alton High Street. The charity’s objectives are: To help support the youth minister in her work with children and young people in the Parish, to help maintain and improve the buildings that belong to the parish, to work with other local organisations by providing discounted or free items of furniture for people in need and to provide a Christian presence on the High Street with a place where friendship and support can be found. In the longer term, it is intended to help those who are struggling to find paid employment by giving them the experience to enable them to return to a paid workforce. The charity is also able to consider contributing to other charitable purposes within the community with help and support as required. The idea for the shop was stimulated by the monthly furniture sales, which had been going for over 30 years. A faithful group of workers have consistently raised money, mostly for church upkeep, over all that time. The monthly sales are a fixture in the community, and continue to be held on the first Saturday of each month at the Parish Centre selling bric-a-brac rather than large items of furniture. The conversion of the shop for opening was carried out by volunteers from Alton Men’s Shed, led by Ian Scott. A representative of the Men’s Shed, Mike Loxley, continues to lend his support by carrying out restoration work on items being sold in the shop. The shop relies on donations of good quality furniture and household items, such as dining tables & chairs, sofas, easy chairs, chests of drawers, occasional tables and small electrical items. However they are unable to take three seater sofas and three piece suites due to lack of space, white goods due to government guidelines or mattresses unless they are unused and still wrapped. If you know of people who are moving house, downsizing, looking for interesting furniture or clearing out their older items, please let them know about Resurrection Furniture and encourage them to donate or visit the shop to browse and hopefully buy, from the diverse range of stock. Volunteers to help run the shop, to manage collection and delivery of furniture and to do other tasks, not all of them strenuous, are always needed. Please contact the shop manager if you might be able to help. Parish members continue to pray for the success of the venture to make it profitable and achieve it’s objectives while maintaining a Christian presence on the High Street.